Chief Minister Kalikho Pul desires that maximum number of youths from the state are recruited in the Indian Air Force and called to conduct the ensuing Airmen Recruitment Rally in Arunachal Pradesh in a massive way. Welcoming the proposal of the Indian Air Force to conduct two separate Air Men Recruitment Rally at Itanagar on 1st October 2016 for the western zone and at Tezu on 5th October 2016 for eastern zone of the state, Chief Minister have assured to provide full logistic support in terms of man power requirement, transportation, accommodation, etc for the rally. It is worth mentioning that the conduct of recruitment for defence purposes for eastern zone and western zone in appropriate centres was agreed upon by the centre after the Chief Minister had made the proposal for benefit of the applicants. Instructing the Deputy Commissioners Capital Complex and Tezu to select proper sites for Recruitment Rally, Pul asked them to make all necessary arrangements for the rally and provide basic requirements like drinking water, toilets, electricity, food, medical team, etc at the rally sites. He told them to coordinate with the Deputy Commissioners of other districts too and also instructed them to arrange for to and fro journey of the candidates who will be coming to take part in the rally. Emphasizing on wide publicity of the matter, CM asked to make use of media, banners and posters well in advance regarding the recruitment rally with details of eligibility criteria, methods of selection, vacancies, etc. He urged to involve all administrative centres in the process and to circulate the advertisement in all offices, schools and colleges so that the information is reached to every nook and corner of the state. Chief Minister appealed to all the aspiring youths of the state to take maximum benefit and make best use of the opportunity. He wished that maximum numbers of youths from the state would participate in the recruitment rally and qualify for the Airmen in the Indian Air Force. Pul also hoped that the Arunachalee recruits will prove as able Airmen and urged the Air force official to recruit as many candidates from the state. He stressed to select candidates from Arunachal not only based on their intellectual acumen but to consider their harsh living environment from which they belong. Since Arunachal is a hilly state, their service is highly essential as they are well acquainted with the local terrain and will have sense of belongingness, which caters well to the need of the country, asserted the CM. Squadron Leader VPV Baliga, Commanding Officer while briefing the Chief Minister about the plan of Recruitment Rally said that it is mainly conducted in the state for the benefit of aspiring youths to increase representation from the region in IAF. He sought the support of the state govt for successful conduct of the rally for maximum participation in the Recruitment Rally. Calling for the youths of the state to participate enthusiastically, he informed that the Indian Air Force offer an attractive benefits in the form of handsome pay and perks, free rations, clothing, medical cover, accommodation, easy loans and LTC, Gratuity and Life cover to its employees. Baliga informed that the Rally will be conducted at Itanagar to cover the districts under western zone namely West Siang, Upper Subansiri, Kra Daadi, Lower Subansiri, Kurung Kumey, Papumpare, East Kameng, West Kameng and Tawang. Rally for Eastern Zone will be conducted at Tezu which will cover the districts namely Siang, Upper Siang, East Siang, Dibang Valley, Lower Dibang Valley, Anjaw, Lohit, Namsai, Changlang, Tirap and Longding. Highlighting salient feature of the Rally, he informed that there is no vacancy limitation, however the selection will be purely based on merit and performance of candidates. He further informed that candidates who pass 10+2 in any discipline with 50% aggregate and 50% in English or Diploma and those who attain age between 16-21 years will be eligible to participate in the Recruitment Rally. 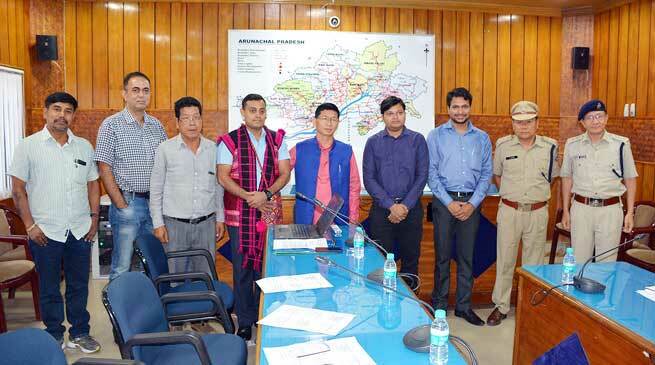 Also present in the meeting were P D Sona, MLA Mechukha, Olom Panyanng, MLA Mariyang-Geku, Dr Mahesh Chai, MLA Tezu, Sandeep Kumar Singh, DC Capital Complex, Danish Ashraf, DC Lohit, Kime Aye, SP Capital, Guni Pertin, incharge SP Tezu, Obang Tayeng, Director IPR and D Battcharjee, Assitant Director, Labour & Employment Department.